Minimum wage is definitely less than 800E. And where’s the Price Index? 1858E in pension? Yeah maybe if you’re a lawmaker or a frickin president. Avg pension is not above 800E. And comparisons with Estonia are ridiculous. 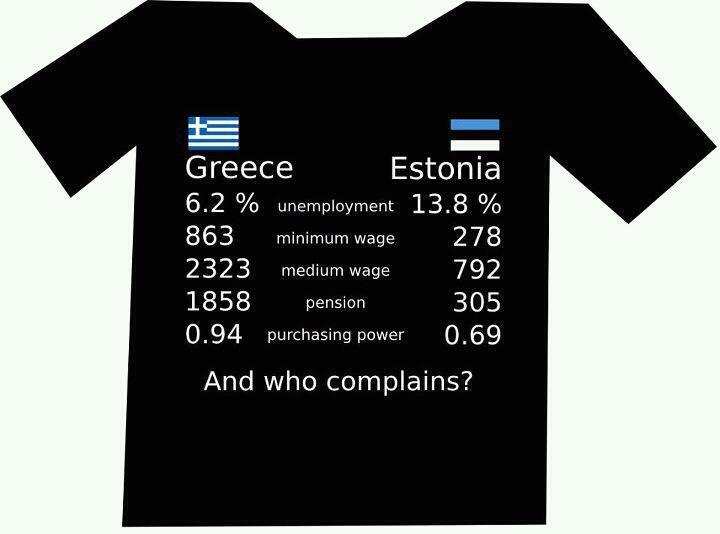 Estonia is a en-communist country, Greece is supposedly a pro-European state after 2nd WW.. Thank god we got higher salaries.. It’s not a who’s got the lowest competition! i think Greece shuold support Estonia instead of Estonia helping Greece. aah?? What a rediculos complainig! Shut up and work i say.